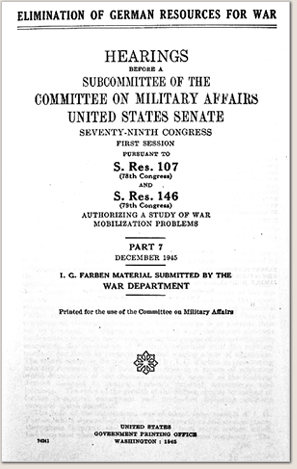 This is the title page from the official 1945 report that followed Hearings of the US Congress on the causes of WWII. The report was prepared by Colonel GSC Bernard Bernstein immediately after the end of World War II and published in November 1945 by the US Office of the Military Government in Germany. Bernstein and his team were the first officials to have access to the files of the oil and drug cartel IG Farben at its headquarters in Frankfurt, its Nazi-liaison office in Berlin and other locations. The relevance of this report is particularly high, because Col. Bernstein and his team of military officers had unprecedented access to the offices and documents of IG Farben and were thus able to prove beyond any doubt its decisive role behind World War II. This 1945 report by the US Office of the Military Government predates the proceedings of the Nuremberg War Crimes Tribunal by two years. But these were decisive years. Under the growing influence of the Rockefeller and Rothschild groups on post-war world order and with the beginning of the "Cold War", much of the initially available evidence against IG Farben disappeared, was destroyed, or was declared inadmissible in the 1947/1948 Nuremberg trial against the cartel. Thus, the 1945 "Report on the Investigation of IG Farbenindustrie A.G." by the US Office of the Military Government in Germany is the original report by the Allied powers that establishes the direct responsibility of the IG Farben cartel for WWII, the holocaust and, ultimately, for the deaths of over 60 million people.